Da Capo Press, 9781569243459, 400pp. 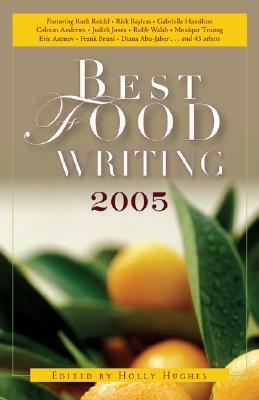 Best Food Writing 2005 assembles, for its sixth year, the most exceptional writing from the past year's books, magazines, newspapers, newsletters, and Web sites. Included are the best writers on everything from celebrated chefs to the travails of the home cook, from food sourcing at the greenmarket to equipping one's kitchen, from erudite culinary history to food-inspired memoirs. Like past collections, the 2005 round-up will include pieces from food-writing stars such as Robb Walsh, John Thorne, Calvin Trillin, Amanda Hesser, Ruth Reichl, Colman Andrews, Jason Epstein, and Jeffrey Steingarten. Opinionated, evocative, nostalgic, brash, thought-provoking, and sometimes just plain funny, it's a tasty sampler to dip into time and again, whether you're in the mood for caviar or hot dogs. Holly Hughes has edited the annual Best Food Writing volumes since their inception in 2000. The former executive editor of Fodor's Travel Publications, she is also author of Frommer's New York City with Kids. She lives with her family in New York City.